Persistence Market Research presents a comprehensive analysis of the global immuno-oncology market in a new publication titled “Immuno-Oncology Market: Global Industry Analysis and Forecast 2017-2025.” This report covers the analysis of immunotherapy-based products being used for different cancer indications across different geographical regions over an eight year forecast period 2017 – 2025, which provides useful insights highlighting the various opportunities available to market investors, drug manufacturers, healthcare professionals and other key stakeholders operating in the global immuno-oncology market. In the process of analyzing the global immuno-oncology market, extensive research has gone into identifying the various therapies used in the treatment of cancers that form the core components of the scope of study, as well as highlighting numerous developments that are likely to impact the global immuno-oncology market performance during the period of assessment. A dedicated effort has gone into classifying the various market drivers and restraints, trends, and opportunities for players operating in the global immuno-oncology market in the coming years. Through extensive research, a dedicated team of healthcare analysts at Persistence Market Research have studied how the different market dynamics are likely to impact the current environment and future scenario of the global immuno-oncology market, thereby providing useful insights to market players to plan their differentiating strategies capable of evolving with the changing market landscape. The publication on the global immuno-oncology market begins with a crisp executive summary that highlights the current market scenario, key market dynamics and a forecast of the global immuno-oncology market revenue during 2017 – 2025. This is followed by important market definitions and the market taxonomy, highlighting the various categories covered in the scope of the report. A snippet of key developments in the global immuno-oncology market has been provided, followed by cancer epidemiology data for key regions covered in the report. The next section provides a deep dive into the key market dynamics and presents qualitative insights into the various drivers, challenges, and market trends that are likely to define the global immuno-oncology market in the next few years. The report then jumps into a comprehensive analysis of the global immuno-oncology market in terms of revenue, including Y-o-Y growth projections and absolute dollar opportunity analysis, highlighting key takeaways and performance metrics. The last section of the report is devoted to showcase the market performance of some of the key players operating in the global immuno-oncology market. The report profiles a few of the leading manufacturers of immunotherapies and presents a detailed analysis of their overall business performance and a comprehensive evaluation of product and business strategies, highlighting some of the recent developments for each player in this market. This section is intended to provide report audiences with a dashboard view of the competitive landscape of the global immuno-oncology market, as well as the market share held by some of the major players operating in this market. Exhaustive primary and secondary research forms the core of Persistence Market Research’s tested research methodology for forecasting the global immuno-oncology market performance over the assessed period. Data thus acquired is sliced and diced based on the relevant parameters and further validated using the triangulation method and finally scrutinized using advanced tools to glean pertinent qualitative and quantitative insights into the global immuno-oncology market. All the insights provided in this report are supported by relevant metrics estimated for the various market segments across the assessed regions. The report is a comprehensive bundle of useful market insights and critical data points pertaining to the global immuno-oncology market and is intended to provide readers with a magnified view of the global immuno-oncology market over the next eight years. When developing the market forecast, the first step is to size the current market, which forms the basis for forecasting how the global immuno-oncology market is anticipated to perform in the future. The analysts have used a bottom-up approach to assess market numbers for each therapy category and counter-validated market estimations by analyzing spending on oncology treatments globally. Also, macro-economic indicators such as healthcare expenditure, epidemiology of cancer, adoption of different types of therapies and a comprehensive assessment of drugs in the pipeline have been considered to forecast market numbers. This report on the global immuno-oncology market encapsulates the key metrics that accurately describe the growth trajectory of the global immuno-oncology market over the next eight years. The analysts have used this data to compare market performance across the various segments and regions. 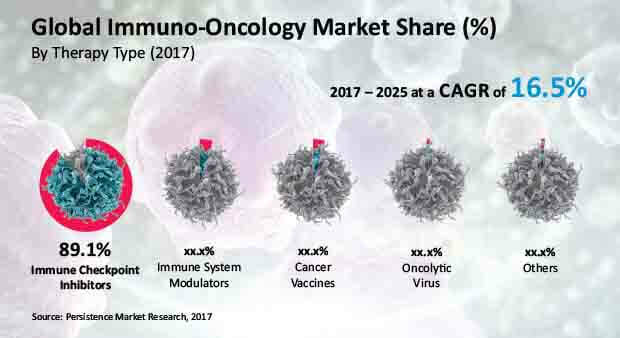 Besides estimating the Compound Annual Growth Rate (CAGR) for the global and regional markets, the report also presents an in-depth analysis of the global immuno-oncology market on the basis of parameters such as Year-on-Year (Y-o-Y) growth to understand market predictability and to identify the right opportunities likely to emerge in the global immuno-oncology market. Further, the different market segments have been studied by performing a Basis Point Share (BPS) analysis to understand the relative contribution of individual segments to overall market growth. Another notable feature of this report is an analysis of the revenue forecast of the global immuno-oncology market in terms of absolute dollar opportunity. While this is usually overlooked when forecasting the market, absolute dollar opportunity analysis is critical in assessing the level of opportunity that market players can look to achieve and also to identify potential resources in the global immuno-oncology market. Finally, the importance of dissecting the different market segments in terms of their growth and performance in the global immuno-oncology market cannot be stressed enough; and towards this end, Persistence Market Research has developed a unique market attractiveness index to help market players identify current and future market opportunities. The next generation of drugs to treat cancer involves stimulating a person’s own immune system to selectively attack cancer cells while keeping normal cells unaffected, or delivering certain immune system components in order to inhibit the spread of cancer effectively. One of the hallmarks of certain types of cancers is the suppression of the body's immune system, rendering it unable to fight the disease. These therapies have shown great promise in several clinical trials as well as in patients currently being treated. Among various immunotherapies used in cancer treatment, the most widely used are immune checkpoint inhibitors, which currently account for over 88% of the global immuno-oncology market. The market share for immune checkpoint inhibitors is likely to reach well over 90% in the coming years, owing to their first-to-market status. Most of the currently approved immunotherapies are being used in the treatment of melanoma. However, lung cancer is the fastest growing segment by therapeutic indication. In addition to gaining regulatory approval for various immuno-oncology drugs as stand-alone targeted therapy, companies developing these are also seeking to use them in combination with existing antibody therapy or a combination of multiple immunotherapies. For example, Bristol-Myers Squibb has obtained regulatory clearance to use the Opdivo + Yervoy regimen in multiple markets for the treatment of melanoma. In addition, numerous drug candidates are part of various clinical studies, and the ratio of new drug approvals for immunotherapy-based treatment as compared to standard treatment has consistently increased in the last five years. Another factor driving the growth of this market is the accelerated approval process being granted by various regulatory agencies, such as fast track and breakthrough designations. Biomarkers and pharmacogenomics studies are used to identify patients who are likely to respond well from immunotherapy-based treatments in order to maximize benefits such as increased response, progression-free and overall survival, as well as decreased toxicity. The ability to select these patients from a wider pool has resulted in a higher rate of adoption for these therapies, thereby leading to an optimistic growth scenario for the overall immuno-oncology market across the globe. Skin cancer is one of the most common types of cancers, and melanoma of the skin accounts for about 1% of all skin cancers and is responsible for a majority of resulting deaths. The American Cancer Society estimates that over 87,000 new cases of melanoma will be diagnosed in 2017 in the United States alone. The first immune checkpoint inhibitor to be approved by the FDA was Ipilimumab (Yervoy) in 2011 for the treatment of unresectable or metastatic melanoma. Most companies have been successful in obtaining regulatory approval for the use of immuno-oncology drugs for the treatment of melanoma because of the excellent clinical response of these classes of drugs against melanoma. According to literature, melanomas have the highest frequency of mutations compared to different types of cancers, which makes it an excellent target for immunotherapies. After the approval of Yervoy, several other candidates have also been used in the treatment of melanoma, which has led to melanoma accounting for the largest share of the global immuno-oncology market in terms of revenue in 2016. As biomarkers are identified in the regulation of other cancers, it is expected that developers of these new drugs will seek regulatory approval for multiple indications. Considering that one of the leading causes of cancer-related deaths in the world is due to lung cancer, it is anticipated that the revenue attributed to this indication will be one of the fastest growing at a CAGR of 18.6% over the forecast period.